I first had fennel sausage at Campanglolo, a fun, rustic Italian restaurant in Vancouver. The sausage was scattered on a delicious pizza with just the right amount of crisp and chew. The pizza was fantastic, but the fennel sausage was the star. I literally wanted to pick off the few pieces of sausage on the pie and stuff them into my mouth to make one satisfying bite. I refrained from acting like a savage in public, but I couldn’t get the fennel sausage out of my head so I set out to make a pork and fennel meatball that i could really get my teeth into. If you’ve never tried cooking fennel seeds before, you’re in for a treat. Their crunchy, slightly anise flavour is the perfect compliment to pork. Toss these meatballs with your go-to sauce and some pasta for a bowl of comfort. 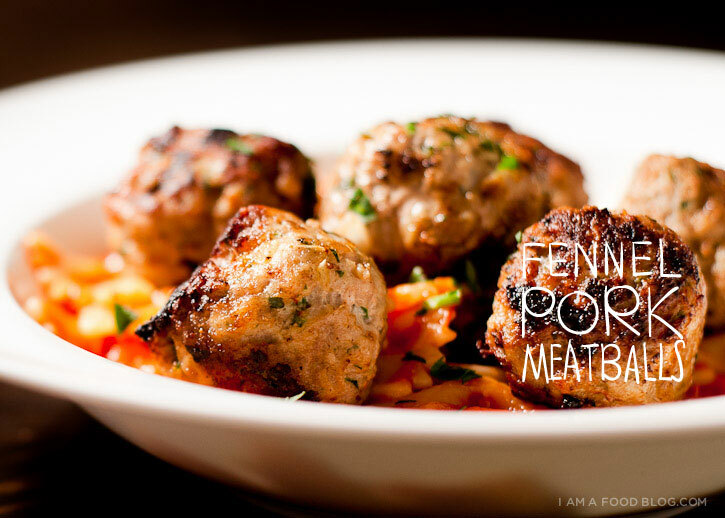 I am pork-y, I am balled: I AM FENNEL PORK MEATBALL! In a small sauce pan, heat up a splash of olive oil over moderate heat. Add the onions and fennel seeds and cook until the onions are translucent and slightly brown, about 6-8 minutes. Remove the onions and fennel seeds from the pan, set aside to cool. 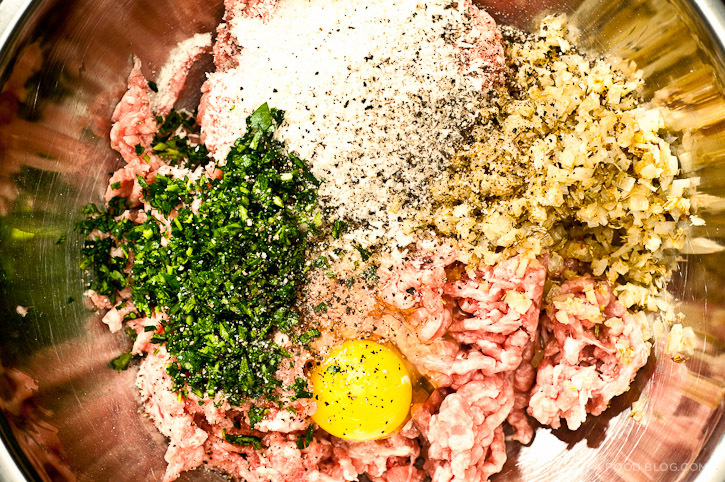 In a mixing bowl, combine the ground pork, parsley, panko, egg, salt, pepper, and the cooled onions and fennel seeds. 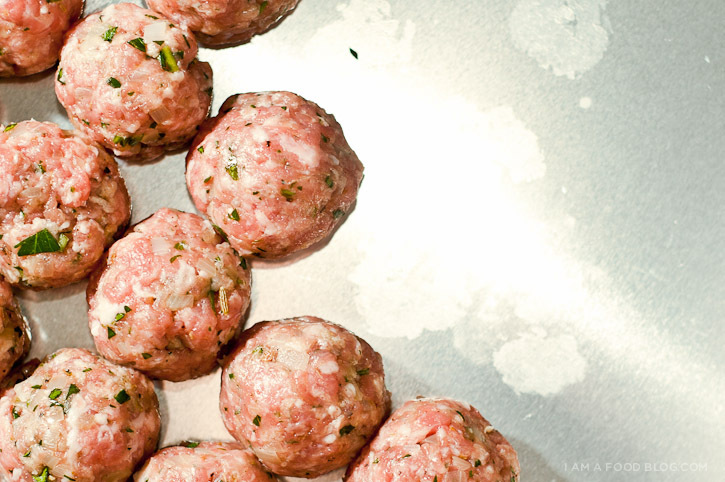 Mix well and shape into 1-inch size meatballs (about 1.5 to 2 tablespoons). Heat about a tablespoon of oil in a large skillet over medium-high heat until hot and shimmery. 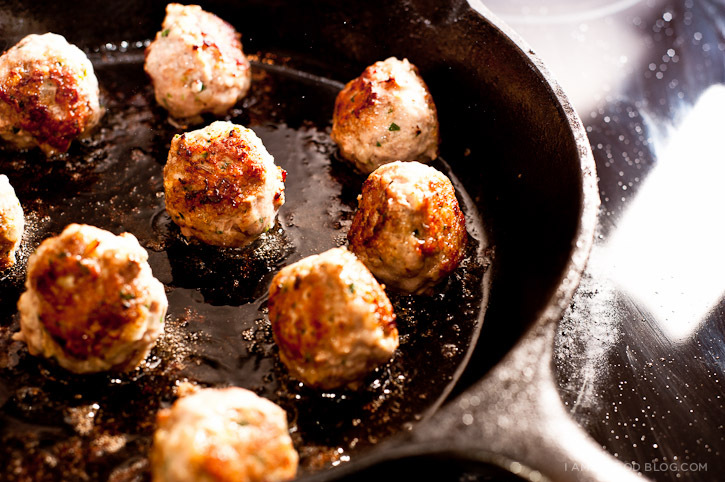 Add the meatballs to the pan, being careful not to overcrowd. Brown the meatballs on all sides, turning as needed, about 4-5 minutes per side, 20 minutes total. Check for doneness by cutting one open and ensuring there is no pink. Enjoy as an appetizer hot, or serve with your favorite sauce and pasta. Very beautiful presentation! 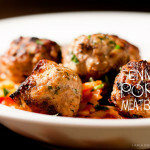 I’ve never tried a pork meatball but I’m thinking I just have to now!!! I love fennel, especially with pork. This sounds great! 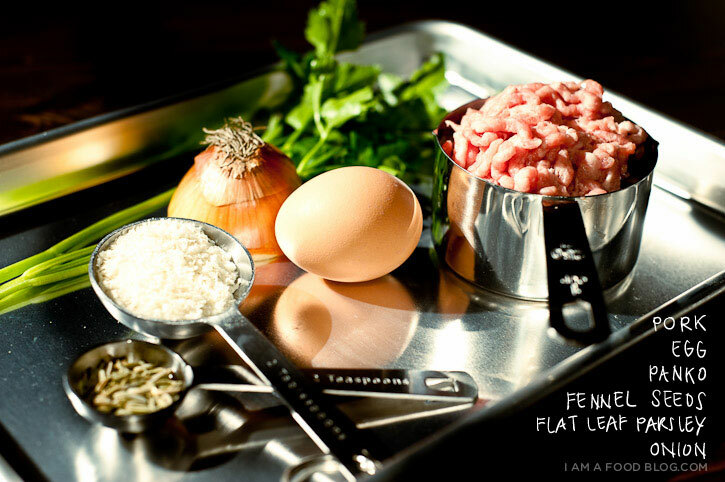 These meatballs look delicious and I love the addition of fennel seeds! Great presentation and pictures! We made these a few months ago as well and can vouch that they are delicious! So much lighter than your traditional beefy meatballs. Made these and they are fantastic!!! Thanks! Wow, wow, sooo good… please give this a try. Did two things different, replaced the breadcrumbs with 1 1/2 slices of white bread soaked in a little milk (ensures a tender meatball every time!) and added a little garlic. These meatballs look incredible! It’s been a while since I’ve made some, maybe it’s about time to try this recipe! I just discovered your website and tried this recipe! I loved it! I just made out my shopping list! I am going to cook it as “loose meat” and use it on a thin crust pizza with creamy garlic sauce and goat cheese. (yup! I tried one at Pappa Murphys and was hooked}! Could the parsley be substituted with fresh fennel fronds? Oh wow I have no words… I have been trying to decide on a good meatball recipe to cook for a week now with nothing really grabbing me.. until now! My favourite restaurant makes something similar, I don’t know how I never thought to try them at home. Thank you a million times. Omg fennel….. Num num num in my belly! Tried them tonight. Look very moist and great presentation but I have to say they were quite dry. Good thing I had a sauce with pasta with them. This my go 2 meatball for anything pizza,subs,with sauce or to just eat! I grind my pork it comes out moist and delicious whether I bake,fry or deep fry. I used Parmesan instead of breadcrumbs and I seared mine on all sides and then put in convection oven for about 20 minute in some marinara sauce.